As a dad, few things are worse than hearing your child has been repeatedly tormented by a bully at school. Bullying can be different for boys and girls, but the initial objective remains the same – humiliation and exclusion. Approximately 28 percent of children between ages 12 and 18 admit they were bullied in school during the 2008-2009 school year, according to the National Center for Education Statistics. Today, these unfair occurrences have become even more complicated with the rise of cyber bullying on social networking sites like Facebook and Myspace. While your initial reaction to this news might be outrage and anger towards this bully mixed with a desire to give him a taste of his own medicine, it's important to remember that parental intervention is rarely the answer. Unfortunately, this is your child's battle to fight – your job is to provide the tools and knowledge to help them fight it. An important first step towards helping your child combat bullying is helping them understand why bullies exist. Explain that bullies are often compensating for an issue or insecurity in their own lives – targeting others to disguise the pain. By demonstrating this, you'll help your child understand that it's nothing he or she is doing wrong. Share your own experiences with bullying as well. However, this knowledge alone won't be enough. 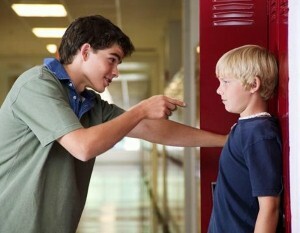 Your child's best defense against bullying is to simply ignore taunts. Bullies thrive on negative attention, so showing that you're easily bothered is fuel for the fire. Advise your child to stay calm and simply walk away. However, sometimes this isn't enough to escape from a bully. If the abuse escalates, you may want to get school administration officials involved.